This holiday is going to be a doozy for eCommerce! With that said, it’s important to note that the success of your holiday season sales depends on how well your eCommerce site performs during the ‘rush hour’ and how well it’s able to convince casual visitors to convert into paying customers. The fact is, you will get increased traffic to your website, as shoppers are looking for the best online deals. But, on the downside, these holiday shoppers are merciless. They don’t care that you have spent lots of money and time to bring them to your eCommerce website – If they come across any small glitch, they will leave, without giving a second thought. But fear not! To convert holiday shoppers, you need to be savvy and an opportunist. That’s why we’ve compiled these common 8 mistakes most eCommerce store make – Mistakes that could be your biggest conversion killers! 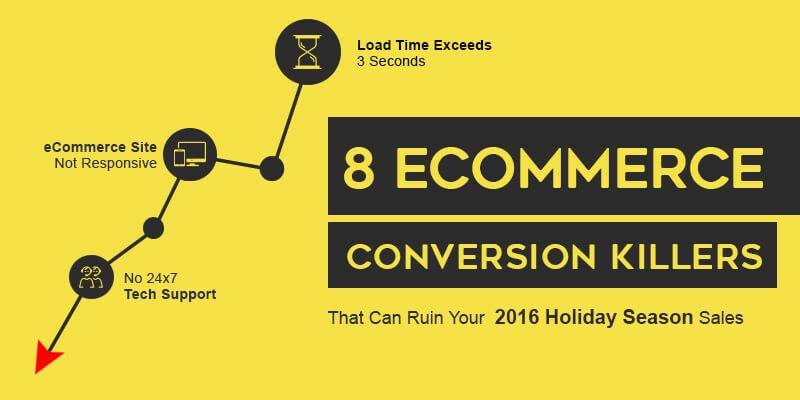 If your site doesn’t fully load in 3 seconds, expect your holiday shoppers to leave. They’re in a hurry and don’t have the time to wait for your site to load. Curious about what your site load time is? Head over to Pingdom Website Speed Test and key in your eCommerce website URL.This tool helps you check your loading time for the region of your target audience. Amazon is an eCommerce giant with a gazillion pictures, videos and links on their homepage, but, their website loads almost instantly. They have a remarkable load time of 1.54s! You might not have to invest too much on server space if your website is optimized to its optimum performance. You can definitely reduce the load time considerably by implementing the following speed hacks to your website. Customers use smartphones and tablets 80% of the time to access their emails, social media accounts and also the internet. And, most of your marketing efforts are geared toward emails, social media advertising and re-targeting banners. So, your potential buyers will come across your ads on their smart devices and enter your eCommerce website using their mobile browsers. But what if your site is not completely responsive? They will leave. Simple as that! This makes being ‘mobile-ready’ ridiculously important and essential part of your successful holiday sales. Eager to know how mobile-friendly your website is, then take a look at this article asking is your website really mobile friendly? Optimizing your website for mobile browsing is essential to have an effective ROI on all your marketing campaigns. You could be missing out on some important pain points that aremaking yourcustomersnot convert. Site audits are important to improve your website’s user experience. It helps you understand how customers and search engines perceive your website. To help you understand the conversion elements of your eCommerce website, we’ve put together a post ‘111 eCommerce CRO tips’. You can use these to frame the perfect site audit that fits your eCommerce process. To implement the site audit, all you need is Google Analytics, as it willshow you how shopper’s navigate your website and identify the major issues to improve your eCommerce conversion rate. Your holiday shoppers will thank you for making the site navigation more seamless and improving product visibility by increasing your sales. Maybe need a little more help? Contact our eCommerce Conversion Rate Optimization Team! A study shows that 44% of online shoppers prefer live chat because most of their queries are handled by a live person immediately. It’s one of the most important features that helps them make the online transaction. As we move towards a crowded eCommerce space, personalization is important to let shoppers know you care. Showcase ‘Products You Love’ and ‘Recommended Products’ section to improve product visibility. The key is not to have the section and just display random products – Rather, it should make use of user’s cache and recommend the right product for maximum conversions. Remember, your holiday shoppers are browsing multiple websites and it’s important you capture their attention instantly to get them to transact with you. Once again, Amazon does a great job with respect to personalization. I was looking for the latest Peppa collection 6 months back and when I come back to the website and find it on the homepage, I am more likely to pick one up. The holiday season makes shoppers more generous. There are plenty of studies and reports that show holiday decorations and jingles improve retail sales. When your website doesn’t reflect the holiday mood, you might be missing out on hundreds of sales. It’s not enough that you just design a banner with snowflakes and Santa Claus, but display products that are in sync with the holiday mood and colors. You can also come up with creative sections like ‘Gifts Under $10’ or ‘Just For Your Loved Ones’ to engage better with shoppers. You could be losing a lot on the marketing budget! It’s essential you target all your campaigns to get maximum results. Understand your client behavior and plan your holiday campaigns. Even if you have marked the important dates, it’s not enough that you send out mailers based on it. You must study your website and find the exact time and day when customers are most active. The best way to go ahead with it is to pull out the Google Analytics report for the last holiday season and map out your customer behavior. It should give you a fair idea about the time and days your customers will visit your website. Targeting campaigns based on such findings will help increase the effectiveness of your marketing budgets, as well as ensuring better ROI for each campaign. Forget your Bahamas Trip planned with the holiday season profits. Big eCommerce websites like Walmart have crashed during the holiday season rush and what’s to say your website won’t? Having your website down for even an hour could be adeal killer. You’ll not only lose the particular transaction, but also lose the customer forever. Having at least a basic maintenance plan is essential to monitor your eCommerce site uptime, as well as getting it back up instantly to ensure you don’t lose sales or customers! Making even one among the 8 conversion killers can cost you your sales. Talk to our conversion experts to revamp the perfect eCommerce store that gives the best user experience this holiday season. Be proactive and have a profitable holiday season!